And that, from the first person point of view of our narrator, is about as succinct a description of this bizarre book as I can record. Bizarre, but of course wonderful at same time. The old man is the girl’s grandfather, a biologist who says he is researching the mammalian palate. Apparently he has hired our nameless narrator, later called a Dreamreader, to launder and shuffle numbers by converting them in his brain. The Town resembles Stepford to me, or the land where It dwells in A Wrinkle in Time. It does next seem that its inhabitants (such as the Colonel, the Gatekeeper, the Librarian) are allowed personal choice, or freedom to be themselves. In fact, it seems as if they have been robbed of emotions which make life less than orderly. The Librarian, in fact, is unfulfilled. No matter how much she consumes for dinner, she is never satiated. She claims it is because she has a gastric disorder, but I think the emptiness reflects her heart, rather than her stomach. “That much I know too well,” I say. We read this novel to look at parallel universes which Haruki Murakami presents to us. We read it to dwell in the fantastic, and finally, to ponder the mystery of it all. 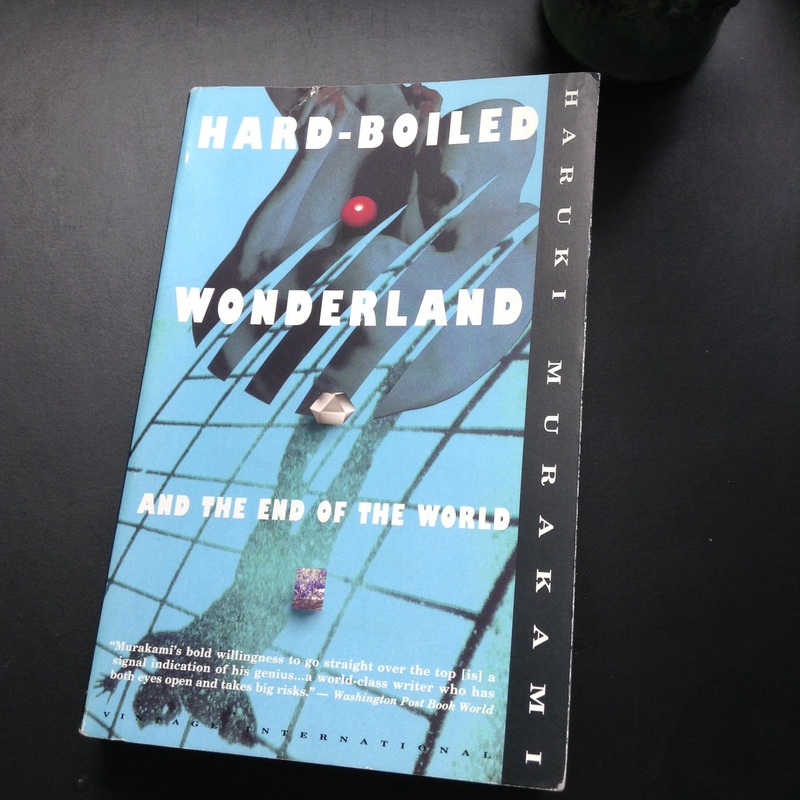 The Hard-boiled Wonderland and the End of The World won the Tanizaki Prize in 1985. Part science fiction, part fantasy, part “hard-boiled” detective (influenced by Murakami’s admiration for Raymond Chandler), this novel is all Murakami. They who never wanted family are now lonely old men. Maybe no one finds it, or even misses it, but fairness is like love. What is given has nothing to do with what we seek. With this novel begins the Japanese Literature Challenge 9. It runs from June, 2015 through January, 2016, and for the challenge you “must” read only one piece of Japanese literature. I have listed the people who indicated interest, or said they would jump in with both feet, below the button. I hope that anyone else who desires to read Japanese literature will join us in our discoveries. How excited I am to begin! Welcome! Please find the review site here. As you know, I’m a big fan of Raymond Chandler, so this sounds like a Murakami novel I might get along with. (I’m not sure if I’m the right reader for some of his novels as my experience has been a little mixed…so it goes) That said, I am curious about the world he creates. Love your review of this one – a great start to your celebration of Japanese lit! Jacqui, I know that you only tentatively committed, and please don’t feel I’m obligating you to participate. I hope that you’ll find time with Strangers, a book I loved. Hard-Boiled Wonderland and The End of The World might be a good one for you to try, especially as it is well loved and a prize winning novel. Kafka on the shore was the book that turned me on to this writer. Murakami was such a Chandler fan that he translated his works & visited him when he went to the USA. Thanks, Parrish. I do have a copy Kafka on the Shore, so perhaps that’s the one I should try next. Kafka on The Shore was my first book, too, and that is the book that made me “fall in love” with Murakami’s work. I can’t say that I always understand exactly what he intends, but I love a quote of his that we should be “wide open to possibility.” I take that as permission to interpret his books as I see fit. Anyway, I second Parrish Lantern’s admiration for Kafka on The Shore. Great book to kick off the Wonderful entity that is JLC 9, remembering this being one of my first Murakami & hence J-Lit reads. This was so complicated! Even more so than Kafka on the Shore with its parallel stories. And the ending! I’m still reeling that he decided to stay in the Town for his Librarian love. I’m not quite sure what I would have decided personally, although I have been a sucker for love. I’ve not read this one, but it definitely sounds like vintage Murakami (which I love!). The only Chandler book I’ve read is The Big Sleep and I remember enjoying it. I love that Murakami uses his influences in his novels – music and authors – makes the books feel more personal. I’m excited to start reading for the JLC9. I’m not sure what I’ll read first though. I was leaning toward Yoshimoto, but Murakami’s books always beckon, so who knows. However, for now I’ll be reading Stephen King’s latest, Finders Keepers. I’m so glad that you’ll be reading for the JLC9. I only have a few Murakami’s left unread, which I guess in a strange way I’m “saving” so that I’ll always have something to look forward to. TJ from My Book Strings and I are reading Naomi in June, which you and everyone else are welcome to do as well. Have fun with Finders Keepers! Jackie, really, it is so weird! I wish that we could have gone out for a coffee or something when I finished it because as I said to Parrish Lantern above, I’m still a little in shock from the ending. Did you anticipate that he would stay in the Town and “forsake” his shadow/self? Do you think it was worth it for love? I’ll be thinking about that for a long time. I’m so glad that you are participating in the JLC9 again; it’s wonderful to have the steadfast participants return every year. I’m unfamiliar with The Hunting Gun, but look forward to your review. This is the only Murakami I have read. “Most bizarre” – you mean they’re not all like this? I remember reading about Norwegian Wood and wondering if I had mixed up the authors – this can’t be by that Hard Boiled Wonderland guy, can it? I vaguely plan to join in on the Japanese event, but I have no idea what I might read. Many months to take care of that. Maybe Sōseki; those are pretty old. Nope, they’re not all like this. But, many of his novels are filled with parallel worlds, and magical realism, like this one. Norwegian Wood is probably the most realistic of any fiction he’s written; that book and this one are the two that launched his popularity even though they’re quite different. Actually, you might like his nonfiction books. Underground was a fascinating account of the sarin gas attack on Tokyo. It brought to light the courage and the strength of the Japanese people in a remarkable way. I’ve heard What I Talk About When I Talk About Running is also fabulous, but I hate running so I haven’t read it. There’s always the choice of a classic. Would you be at all interested in Tanizaki’s Naomi with TJ and I in June? June & July are no good for anything requiring planning – already over-planned. I really should read Tanizaki someday, so I look forward to the pieces about his book. I think I’ll join in this year. Since I have until January to read a piece of Japanese literature, I’m sure I can complete this challenge. I might even read this one, though at this point, I’m kind of saving Murakami books for my retirement. I don’t want to run out of them once I have the time to really sit down and read. I know exactly how you feel! I don’t want to run out of Murakami books, either, and there are only a few for me that are left unread. Although, I could stand to reread every one of them and gain something new each time. As I offered above, feel free to join TJ and I in Tanizaki’s Naomi which we’re reading this June. So glad you’re joining in, James. I’m looking forward to seeing what it is that you choose to read, Ally, as always. So glad you’re joining in again this year! And, won’t it be fun to read more Moravia together? I had never read anything by him before, and I’m eager to read more of his writing. I love the cover on this one. The quote —–They who never wanted family are now lonely old men.—was great as well—very true. It’s so strange, Diane, how you’ll be reading along in a very strange book and all of a sudden you’ll come upon this nugget of truth that Murakami has written. I love finding them, like little surprises along the way. Glad this struck you, too. Hi Bellezza! 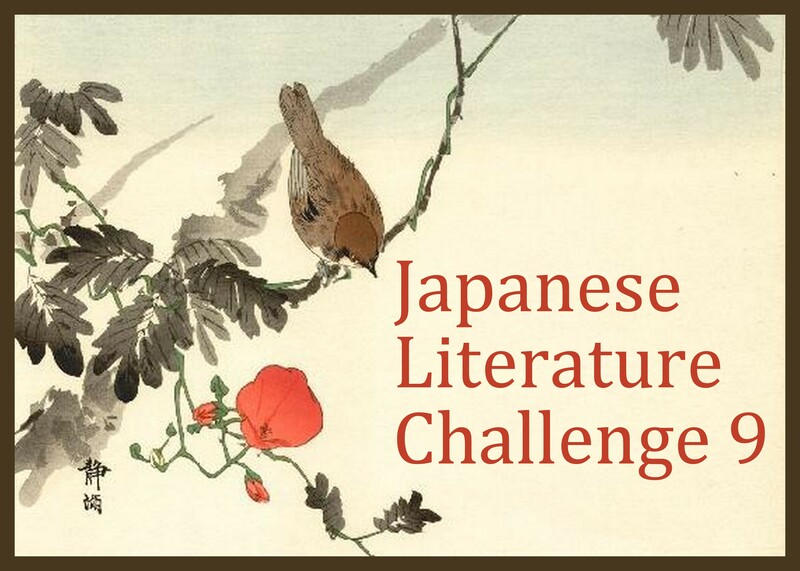 It’s been such a long time since I’ve participated in any of these things, but I still remember the Jap Lit Challenge being one of the first I joined back when I was really active! BTW, the link to the review page doesn’t seem to be working? This was the first Murakami that I read and I loved it. So delightfully bizarre! The Librarian, in fact, is unfulfilled. No matter how much she consumes for dinner, she is never satiated. She claims it is because she has a gastric disorder, but I think the emptiness reflects her heart, rather than her stomach. I never made the connection between her appetite and the emptiness of her life. Thank you for the lovely review.